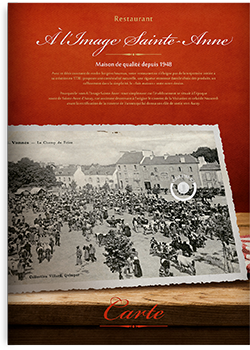 Our traditional restaurant A l’Image Sainte-Anne, renowned place in Vannes area since 1948, offers you traditional and creative meals made of fresh local food. Our menu mixes seaside and countryside spirits in order to provide you with the best from Brittany. Dish of the day at 11€, all included menu at 28€, you will find what you are looking for in our traditional restaurant in Vannes. For your family or business meals during your seminars, our hotel can propose you a private room, welcoming until 50 people. The restaurant A l’Image Sainte-Anne is opened every day from 12 to 2pm and from 7 to 10pm. For your late arrivals, food and beverages can be served at any time in your room or at the bar. Our all you can eat breakfast buffet is available at 9,90€ (half price for children under 10 years old) from 6 to 10 in the morning. Daily dishes at € 11.90, express formula (main course and gourmet coffee) at € 15.90 or 3-course menu at € 20.90, the A l'Image Sainte-Anne restaurant is the ideal place for your meals business or for your meals with friends and family. The restaurant has a private room that can accommodate up to 50 guests during their seminars in Vannes, family events or business lunches. The A l'Image Sainte-Anne restaurant welcomes you every day from 12:00 to 14:00 and from 19:00 to 21:30 (closed on Friday nights, Saturdays and Sundays out of season). In the hotel bar you can enjoy gourmet snacks at any time. The breakfast buffet is served from 06:00 to 10:00 and is available for € 9.90 (half price for children under 10 years of age).